Choosing a private pre-kindergarten is no small decision. Even if your child has attended school from a very young age, the transition to pre-kindergarten is a meaningful and emotional one. You want to ensure that your child is well cared-for, challenged, and understood. A private pre-kindergarten is a wonderful option, but which specific school should you choose? Here are four things to consider as you make your decision. This question is very central to your decision. No matter how wonderful a school is, if it doesn’t fit your family then it will not be a good experience. Look at the hours the school runs and its location. How will the morning and afternoon commutes look? Also, look at the school calendar and attendance policy. Do you have any concerns regarding your child’s ability to attend? Don’t forget to ask about tuition, scholarships, and payment plans. Another aspect to consider is after-school care. Will you need care for your child after the school day ends? Some private pre-kindergartens have caregivers on site, saving you the hassle of figuring out the logistics for moving locations. What Opportunities Does the School Have for Your Child? There are a wide variety of private pre-kindergarten options, and each one functions in its own unique way. When you are choosing a private pre-kindergarten for your child, look carefully at the opportunities each school offers. Is there a particular emphasis on language or STEAM learning? Also, ask questions about the facilities. For instance, what types of technology do teachers use in the classroom? Look at the options for physical activity, such as playground equipment, gymnasium space, and scheduled active play time. Don’t forget to ask about students’ ability to pursue their own natural curiosity in the environment, which is a key indicator of later success. What Curriculum do They Teach, and How? Thanks to a big push for early learning, pre-kindergarteners now learn far more than just numbers and letters. An important consideration in your school search is the curriculum each school teaches and how they make that happen. Ask questions about student-teacher ratios, class size, and classroom design. Because young children often learn in a variety of ways, find out how often multi-sensory experiences are available in the classroom. 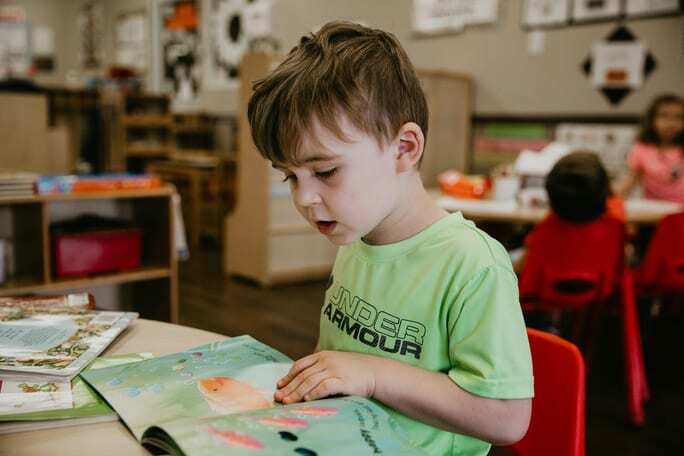 A pre-kindergarten should be focused on experiential learning and developing confidence in order to engender in students a lifelong love of learning. Inquire about character lessons and exposure to the arts, as well. Ideally, the pre-kindergarten year will include as much balance and variety as possible. How Do You Feel at the School? While choosing a private pre-kindergarten, do not neglect a visit to your top schools. Even better, try to visit when a class is in session. Get a feel for the environment, facilities, and teaching staff. We often undervalue our feelings about experiences, but if you are uncomfortable or unsure in a space, it is likely your son or daughter will feel similarly. Introduce yourself to the teachers and ask about their backgrounds. Get a feel for their philosophy and classroom style. Then give yourself time to reflect and process the visit as you decide if you feel the school is a good fit for your family. Pre-kindergarten is a magical time. The students are full of wonder and imagination. They are on the cusp of growing up and becoming elementary students, but not quite there yet. You want to foster that independence and innocence, and you want a school that will teach them with care and skill. As you choose the right school for your family, consider Legacy Academy. With schools in Georgia, North Carolina, South Carolina, and Texas, we are passionate about instilling a love for learning in all the children we serve.